2017 was a year of many firsts for our family. 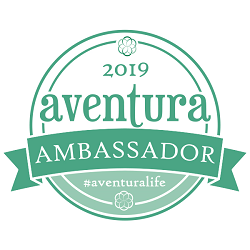 From first-time horseback riding and white water rafting to cliff diving and tubing, adventures are definitely getting bigger as our kids grow. Some of our favorite moments were not fuelled by adrenaline however. When I asked the girls what they liked best this year, they mentioned beach time, cooking bannock over the fire, and stand up paddleboarding (though my oldest prefers waves to flat water) in addition to the "big" adventures. It's an important reminder to seek balance and include the kids in trip planning for the best experiences possible. 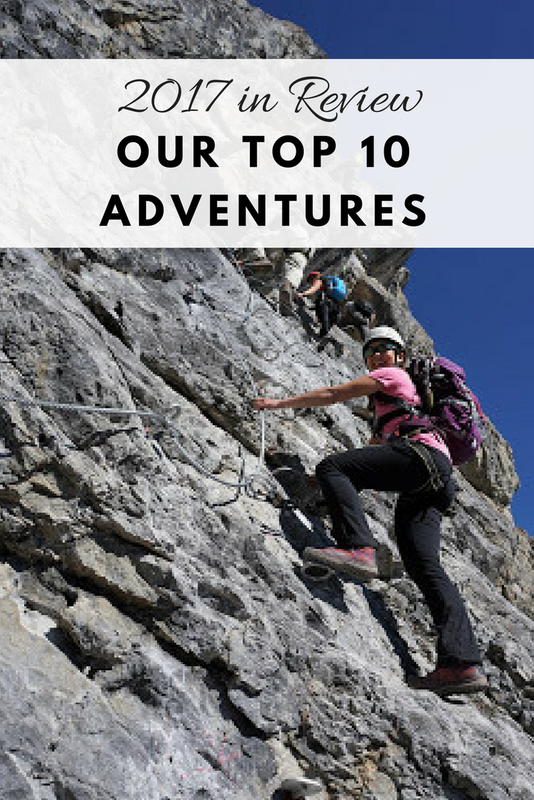 Here are our top ten adventures of 2017. 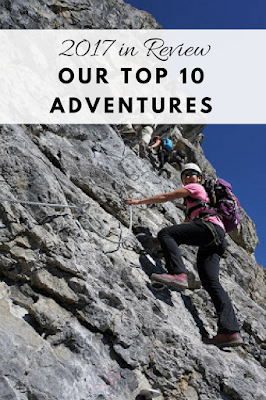 We hope you're inspired to try something new and would love to hear where YOU went this year. Please leave us a comment below! 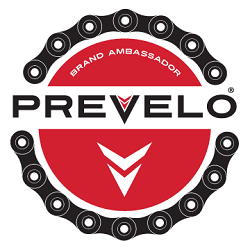 For detailed trip reports, please click the title links below. Tubing at Mount Norquay will literally take your breath away. With the biggest vertical drop of any tube park in Alberta, you can expect to go fast and get air if you're on a run with a bump. Definitely for thrillseekers! 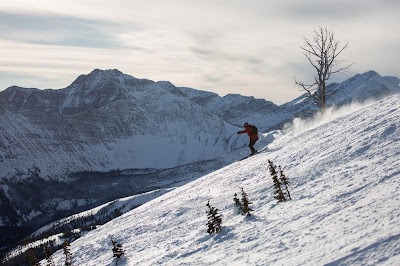 Cat Skiing at Castle Mountain is "the ultimate adventure made easy" where you can ski backcountry terrain with knowledgeable guides in a safer environment (terrain is ungroomed but avalanche controlled). We loved being the only ones on the mountain and look forward to trying cat skiing again! Did you know Castle Mountain gets over 900 cm of snow a year? While you float in powder on the backside of the mountain, the rest of the family can enjoy skiing at the resort. Read more in my story Destination: Castle Mountain Resort. Writing on Stone Provincial Park was one of our favorite places we visited this year. While this trip is low on adrenaline (unless there are rapids or you are afraid of snakes), it is high in fun! 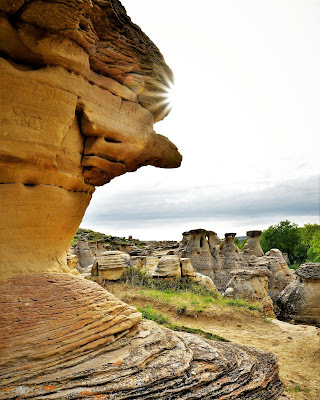 Exploring the hoodoos, look for ancient rock art along the interpretive trail, enjoy beach time, or paddle the Milk River. To learn more about the area's history and geography, sign up for a fascinating and affordable tour. Live like trappers at Rocky Mountain National Historic Site. Sleep in a trapper's tent, cabin, or tipi, then explore the national historic site, play fort, and visitor centre. Staff and volunteers bring the site to life with demonstrations (blacksmithing and more), activities, and tours. My kids learned to start a fire with a flint and steel, and loved cooking bannock (provided in the heritage camping kit) over the fire and watching the bison. The daily puppet show about explorer David Thompson is a must-see! Whitewater Rafting & Cliff Diving near Sundre with Mukwah Rafting was an awesome first for us. As we floated down the Red Deer River, we learned to work as a team on Class 1 to big Class 3 rapids. The mini cliff dive was an added bonus. Check out our short rafting video below! Horseback Riding is a cool way to explore the foothills. We loved our experience riding and staying with Sunset Guiding near Sundre (they have cute cabins for rent). Kids 5 & up can ride! A highlight of our stay was seeing herds of feral horses on the drive from Sundre to the West Country. Mount Norquay's Via Ferrata is perfect for scramblers or beginner climbers who want a safe, but exciting alpine experience. 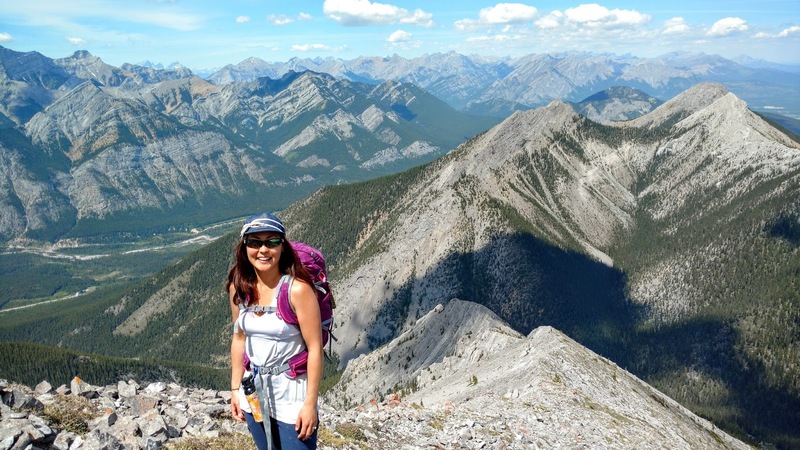 On the 6-hour Summiteer Route (for age 15 & up; 12 & up can do the shorter routes), we climbed 450 vertical metres to the east summit of Mount Norquay. Must like heights! Our friend and children rode the sightseeing chairlift and met us at the Cliffhouse Bistro for a delicious meal after our mountain adventure. 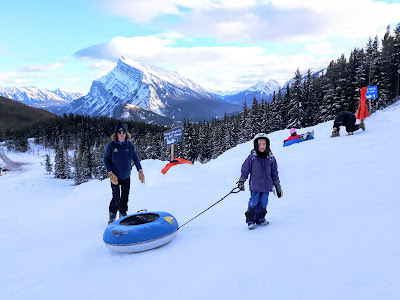 Check out my story Experience Mount Norquay's Sightseeing Chairlift and Cliffhouse Bistro for more information. Summitting Mount Yamnuska As a Family was a major achievement for us this year after two failed attempts due to poor weather. Note that we DO NOT RECOMMEND doing this with little kids!! Several people are rescued each year from this peak. 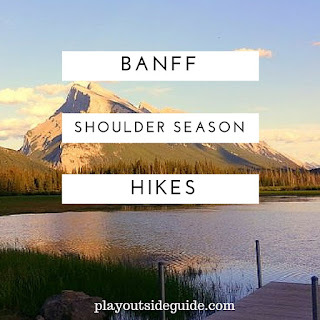 Some easier scrambles to do before this one include: Sarrail Ridge, Mount St. Piran, Ha Ling Peak, Miner's Peak, Midnight Peak, Little Arethusa, Mount Fairview, East End of Rundle, and Heart Mountain. Stand Up Paddleboarding is easier than we thought it would be! 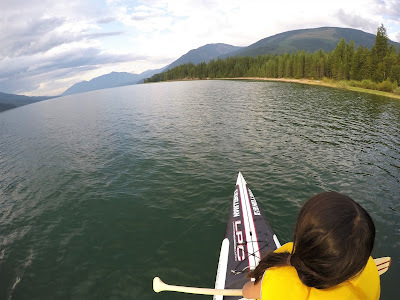 We rented a few times at Little Bow Provincial Park and Surveyor's Lake before taking the plunge and purchasing a couple SUPs for our trip to Nakusp, BC. For a great first-time experience, paddle on calm water on a calm day. Most boards can accommodate 250-300 pounds, so you can paddle with your kids or small to medium-sized dog! Some popular places to paddle near Calgary are Quarry Lake, Johnson Lake, Two Jack Lake, and Vermilion Lakes. Hot Air Ballooning at the Heritage Inn International Hot Air Balloon Festival in High River was an incredible opportunity to get a bird's eye view and learn a little about how to fly a hot air balloon (pretty tricky with no steering wheel!). 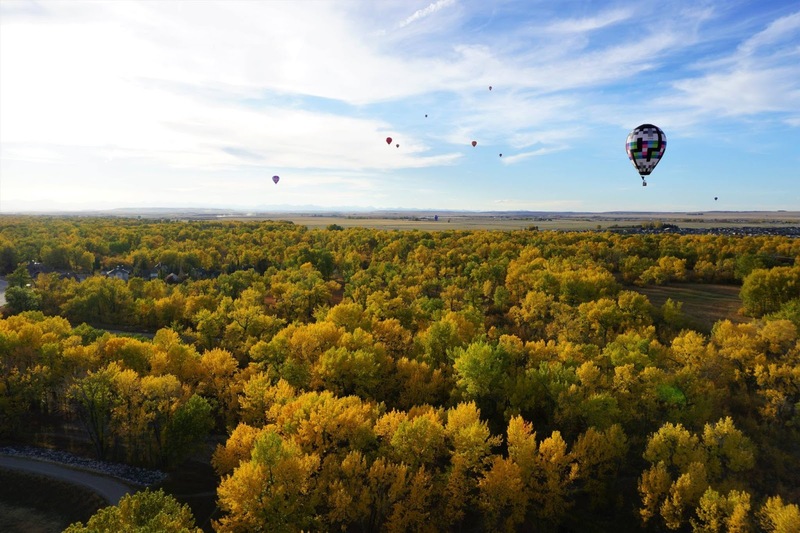 Don't miss the next hot air balloon festival September 26-30, 2018 where you can check out the balloons, see them illuminated at the nightly "glow" events, or purchase a hot air balloon ride for a special treat! All of us at Play Outside Guide wish you a very happy New Year and adventure-filled 2018! What was your favorite adventure of 2017? Tell us in the comments! We'd love to hear where you went. 12 Alberta Parks to Visit in 2018 including Alberta's only park of islands, Alberta's only backcountry canoe circuit, Alberta's 1st provincial park, and Alberta's newest provincial park! 12 Alberta Parks You Should Visit ASAP!